If this rapid intensification continues, fracking's water footprint could grow by up to 50-fold in some regions by the year 2030—raising concerns about its sustainability, particularly in arid or semi-arid regions in western states, or other areas where groundwater supplies are stressed or limited. "Even if prices and drilling rates remain at current levels, our models still predict a large increase by 2030 in both water use and wastewater production," said Andrew J. Kondash, a Ph.D. student in Vengosh's lab who was lead author of the paper. As a statistician I find this article very troubling. The article here, not the original. As for the original article I think it could have been clearer, but it is not misleading. The "real story" you can pull out is that the fracking in West Virginia and Pennsylvania (Marcellus shale) is well managed, and not an issue. The Permian Basin in Texas is not as well controlled, but doing a study like this mixes some early wells which were not similar to the more recent wells. (Do I think that the Permian Basin fracking could be better controlled? Yep.) I don't know as much about the other US formations. Overall? 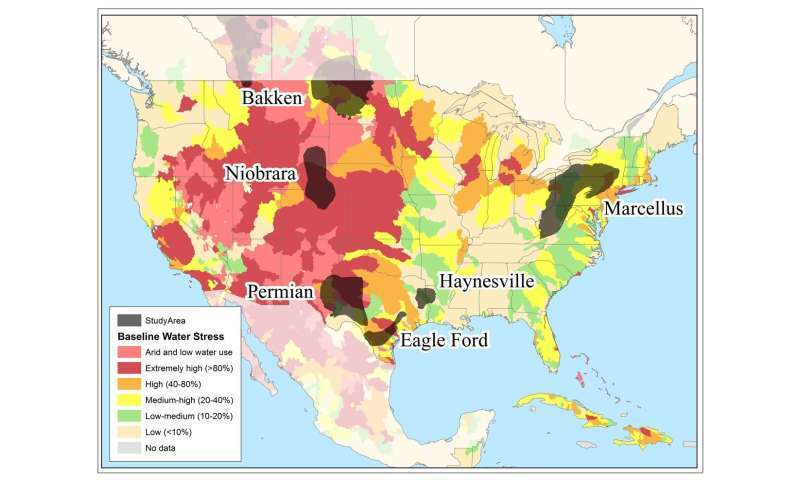 "...it has been shown that the overall water withdrawal for hydraulic fracturing is negligible compared to other industrial water uses on a national level." They also have liters of water used per gigajoule of energy extracted. Oh, one thing they did miss, which messes up their data is that not all wells are the same diameter. Longer wells tend to be larger. we can always flash sea water to fresh if needs be. The benefit of cheap energy far outweighs the propaganda contained herein. @eachus; very good. My instant observation, why did they not report the early 10,000% increase in fracking water usage; that is much more hyperbolic! Earlier even, there was a 1,000,000% increase. "The Problem" is going to be... What happens after the happy-go-lucky oil rush finishes plundering the Nation's resources? The few who profited from corrupting the government will be gone. Far away to enjoy spending their plunder. Giggling maniacally at all those suckers they abandoned back in the destroyed environment. Shootist, math quiz. How much energy will it take to "flash" seawater to drinkable? The cost of producing that energy? Where the hell is it coming from? How much to to transport that water too were it will be needed? Then for safely distributing the water? There is an improbably good side to this destruction of Texas & other territories of the gullible? There have been tentative plans to accelerate the continued depopulation of humans from the Prairies. To be repopulated with bison & the supporting biome. Except it would mean more texan-trailer-trash refugees infesting California! I know! Let's build a wall to keep to keep them out!